We assess the development of competition in the Dutch electricity wholesale market over 2006-2011. In this period domestic generation capacity, both centralized and decentralized, as well as the cross-border transmission capacity increased. Using hourly plant-level data of centralized units and engineering-costs estimates, we estimate the weighted average Lerner index. During super peak hours, the annual average value of this index decreased from 0.23 in 2006 to 0.03 in 2011, indicating more competition. We find indications that the increase in competition can be attributed to the extension of cross-border connections, a higher price elasticity of net demand and more Bertrand-like competition. Enhancing the role of decentralized generation as well as fostering integration of markets seem to be effective measures to promote competition. Recent studies have shown that futures prices do not generally outperform naive no-change forecasts of spot prices, calling into question the usefulness of futures prices for forecasting purposes. However, such usefulness is predicated on the question of whether certain modeling strategies are able to yield more of the information found in futures prices. Applying a forecast-based approach, we study the extent to which alternative ways of modeling futures prices can reveal the extent of the information present in futures prices. Using weekly and monthly data, and futures of maturities of one to four months, we notably examine the out-of-sample predictability of futures prices over various forecast horizons, and in real-time, whereby parameters are updated prior to each sequential forecast. Our results with weekly data are particularly interesting. We find that models allowing for a time-varying convenience yield often produce considerably more precise forecasts over the three forecast horizons considered. Thus, more of the informational content of futures prices is attainable when both the price level and the distance of the latter from spot price are jointly considered, rather than when only the price level is considered. We also document that forecast performances improve with longer date-to-maturity futures, suggesting that the role of the convenience yield is greater when physical oil inventories are held for longer durations. Finally, we show that forecast accuracy is highest at the one year horizon, though the time-varying convenience models have a much higher accuracy than unit-root-based models even over the three and five-year horizons. A price reform in Turkey increased the residential electricity tariff by more than 50 percent in 2008. The reform, aimed at encouraging energy efficiency and private investment, sparked considerable policy debate about its potential impact on household welfare. This paper estimates a short-run residential electricity demand function to evaluate the distributional impact of the tariff increase. The analysis allows heterogeneity in households' price sensitivity and the model is estimated using a nationally representative sample of 8,572 Turkish households. The results suggest that rich households in Turkey are three times as responsive in adjusting consumption to price changes as poor households are. In addition, the welfare loss of the poorest income quintile - measured by the change in consumer surplus as a percentage of income - is 2.9 times that of the wealthiest. Factors affecting the rise of renewable energy in the U.S.: Concern over environmental quality or rising unemployment? Wholesale electricity markets use different market designs to handle congestion in the transmission network. We compare nodal, zonal and discriminatory pricing in general networks with transmission constraints and loop flows. We conclude that in large games with many producers and certain information, the three market designs result in the same efficient dispatch. However, zonal pricing with counter-trading results in additional payments to producers in export-constrained nodes, which leads to inefficient investments in the long-run. With federal policies to curb carbon emissions stagnating in the U.S., California is taking action alone. Sub-national policies can lead to high rates of emissions leakage to other regions as state-level economies are closely connected, including integration of electricity markets. Using a calibrated general equilibrium model, we estimate that California's cap-and-trade program without restrictions on imported electricity increases out-of-state emissions by 45% of the domestic reduction. When imported electricity is included in the cap and "resource shuffling" is banned, as set out in California's legislation, emissions reductions in electricity exporting states partially offset leakage elsewhere and overall leakage is 9%. We examine the exercise of market power in California's power market in 1998- 2000, with a focus on its day-ahead energy market and its five non-utility thermal generating companies. 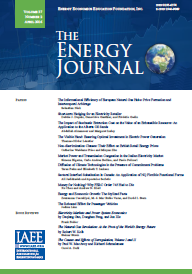 Our goal is to assess whether the hourly bids of market participants, together with information on thermal unit characteristics and power output, suggest that the five suppliers were behaving in line with Nash supply function competition, bidding close to their marginal costs or restraining quantities relative to the Nash level. The analysis of residual demand inverse elasticities suggests that the five thermal generators had an incentive to exercise unilateral market power that was not always fully exploited. A comparison of market-clearing prices, estimated marginal costs and marginal revenues finds that firm conduct was broadly consistent with Nash supply function competition or more competitive than Nash behavior in most of our sample.